Super Affiliate System Review – Internet Jetset vs. Super Affiliate System? Welcome to my Super Affiliate System Review. Many people are confused with John Crestani’s courses. Is it Internet Jetset? Is it a Super Affiliate System? Or is it both? Is there the difference between SAS and Internet Jetset? That’s how my mind was operating while I was starting to learn from John Crestani’s courses. Huh! It’s good that I got out of it. If you have the same troubles, let me help you to clear your mind. Related Article: Internet Jetset Review 2019 – Is John Crestani a Scam? Both training programs created by John Crestani teach affiliate marketing. You see, around one and a half year ago I was learning from the Internet Jetset. This program introduced me to the world of affiliate marketing. When I look into a retrospective, it was a good experience in the end. I haven’t made any money while working with John, but I did learn a lot of cool stuff which I still use today. I was a complete beginner when I started. The website that I made with the help from Crestani got ranked on Google. I even got two reviews on top of the SERP. For someone who never had a website before how cool was that? Even though I had a functional site, I wasn’t making any cash which got me frustrated. John promised fast money, and I believed him. You see, there’s a catch. If you want to learn how to build a website, get to understand the business model, create a proper mindset, and learn a few things for beginners, then Internet Jetset is the deal. However, Super Affiliate System is a different league. 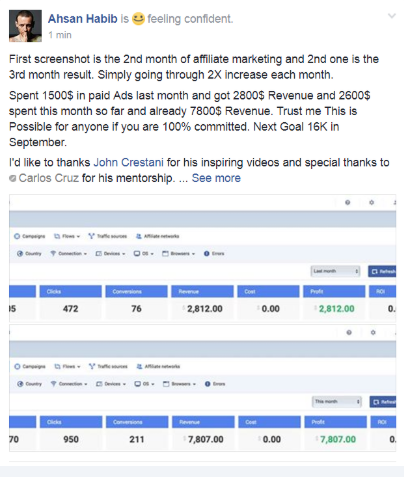 John Crestani is the internet marketing wizard, that’s for sure. He has mastered Facebook and YouTube advertisement and made millions during his career in marketing. I have to say that this guy will sell you, he knows how to sell, and moreover, if you want to learn how to sell online, he’s your guy. But, I don’t approve his selling methodology. You see, I like a more transparent business model. The one he’s applying doesn’t suit my taste, but who am I to speak. The difference between him and me is only a few millions on the bank account. The fact is that he’s selling his stuff like crazy and people are making money! 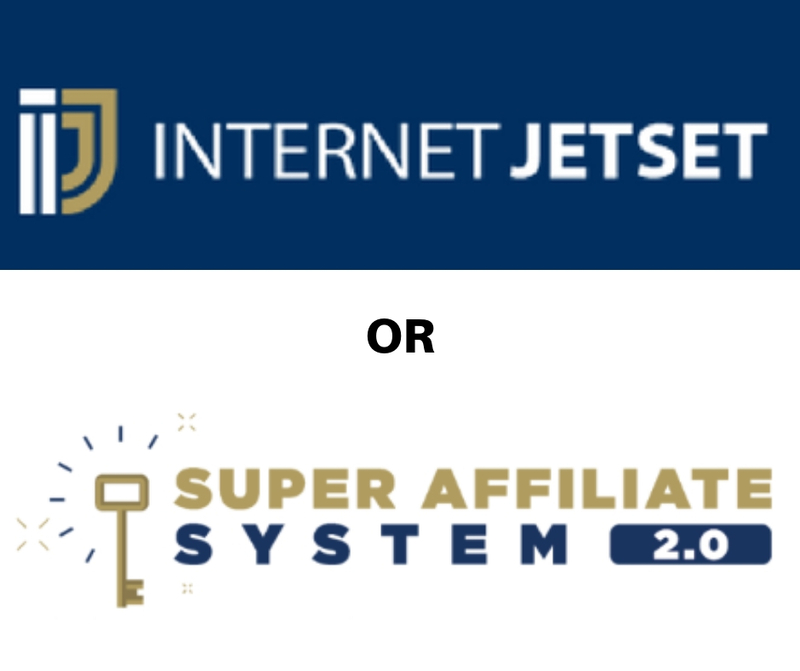 I’ve decided to do this review to show you the difference between Super Affiliate System and Internet Jetset, and to show you what’s the catch. In my previous report of the basic course, I wrote a piece on the eternal question ‘is John Crestani a scam?’ So, if you have some doubts about this guys, feel free to give it a read. Internet Jetset review. Now, let’s move this Super Affiliate System Review in the second gear. Super Affiliate System and Internet Jetset are both products from Crestani’s workshop. The difference is that Internet Jetset is focused on teaching you how to get organic traffic and learning the basics of online business. While on the other hand, Super Affiliate System deals with a paid advertisement. The primary purpose of the Internet Jetset is to teach you the very basics of affiliate marketing and Search Engine Optimization (SEO). People who have the patience to wait on Google to get traffic, they can earn a lot of money after they build a blog or a review site. If you are going to follow those basics for a year, you’ll start to see your first serious results as well. People are impatient these days. They are all hooked on getting rich quick schemes. A vast percentage of people that quit the affiliate marketing system based on SEO do so because they want the money right now! Understand that SEO takes time. However, the results are long-term. The stuff you’ll learn with the Crestani’s basic course will help you understand and apply SEO. On the other hand, SAS is for those who want money right now. It’s based on paid traffic from Facebook, YouTube, and Search Engines. It’s a method which requires constant money investment. Otherwise, if you stop feeding the fire, it will die. If you go with Internet Jetset first, Crestani will use the opportunity during the course to prepare you for Super Affiliate System also. He knows how people are addicted to making money fast. In other words, many people like to gamble to get rich. However, rarely anyone succeeds. In my experience, the Super Affiliate System is similar to gambling. This method will help you to make money fast, but it can also backfire and leave you empty pocket. You can end up losing a lot more than you think. On the other hand, if you follow expert advice, you might win some. I wrote this review intending to help you decide which one is for you. If you want to learn basics, then IJS is for you. However, if you have the cash to invest and you want to double your income, in that case, you should go with SAS. Let’s shift in the third and take a look at Super Affiliate System from a distance. As you’ve learned so far, Super Affiliate System is an affiliate marketing training program that will teach you how to do a paid advertisement using Facebook, YouTube, and Search Engines as a traffic source. You’ll get intensive training where you can learn all the secrets of making money online straight from the best. People are making tons of cash today by using these sales methods. I mean, it’s getting louder and louder with each new day. You see, Facebook and YouTube advertisement work like everything else in the online marketing world. And the main point is, it works! However, for this kind of venture, you’ll have to prepare a substantial stack of cash to invest. Crestani’s Super Affiliate System is the six-week training module. It’s one of the best affiliate marketing courses today. It contains lessons where you can learn how to leverage paid advertisement to make money online. You can learn proven tactics that work on both Facebook and YouTube. John is teaching how to find products that convert, and then how to create sales pages with connecting ads to sell that same merchandise to people who need it. John Crestani is like I’ve said, a marketing wizard. He knows how to sell! He has been making a huge success with Facebook and YouTube over the last few years. Those two sources of traffic have earned him millions. He’s the one who can show you how to master both. I’m going to cover all the details about the training later in this review. Let’s shift the gear and see who is the most suitable candidate. Who is Super Affiliate System for? Super Affiliate System is for people who like the idea of making money with paid advertisement. It doesn’t matter if you are a beginner at this stuff, you can learn a lot from John Crestani. He’s taking care that everyone can understand his methods. Even if you are an experienced marketer, you can benefit a lot from this training. Those people who claim success with this course are the ones who already have a solid foundation in a paid advertisement. This training course on the paid advertisement is, as I’ve said already, for people who are willing to invest money. The course itself is expensive. Moreover, you’ll have to invest a couple of hundreds in paid ads during the course if you want to make it work for you. All in all, I believe that Super Affiliate System is for people who like the idea of making money online fast. Those who wish to risk are going to discover that this one is going to be their pair of shoes. Some people are proving that risk is worth it. You see, John Crestani’s promise that you’ll make money in the first two hours of the course is not a marketing trick. I’ve seen proof of evidence that some people did make their first sales very fast. However, not in two hours like Crestani promises. They’ve made it after a day or two. For some other’s it took a week or two. The point is that they’ve done it, which means that this course works for everyone who wants to invest money. If you are not willing to spend a thousand or two on this course, then this training is not for you! Let’s continue the review, shift the gear and see what Super Affiliate System is from the birds perspective. You’ll learn everything you need about affiliate marketing within the six weeks of the Super Affiliate System training course. It covers everything from a basic website set up, learning how to run a paid advertisement and finally, making money online. It includes over 50 hours of detailed training. I think that John Crestani is a good teacher. He pours over his long term experience with affiliate marketing in just six weeks, helping you to succeed fast. It took him years to learn the things he can teach you in six weeks. Crestani started with his training system back in 2015. For the last fours years, he’s continuously improving his methods. And as he continues to develop his Super Affiliate System, which has started as Internet Jetset, the course is getting more and more effective. You’ll get access to a free webinar where John is going to explain how the whole system works. He’ll give you some food for the thought before you decide to jump in. That is if you choose. If you decide to start, you can purchase the Super Affiliate System straight away. You’ll get the basic training as well. Or you can take Internet Jetset for a lower price if you want to make it slow. Then, when you master the basics, you can upgrade and start learning from intensive six weeks training on paid advertisement. The described approach is suitable for all parties if they have someone to show them how the system works. I hope this review so far has helped you to make an easier decision. Even though I wasn’t participating till the end of his training, I can vouch for Crestani’s course. The only reason why I haven’t finished the Internet Jetset and the rest of the course is because I like to work slow, plus I wasn’t expecting that I’ll have to invest so much. In other words, nobody told me so. On the other hand, John is an energetic guy who knows his stuff although his sales methods are a bit unethical. Expect to have a constant pressure to buy more from him during those six weeks. He knows how pressure works on people. Moreover, he’ll show you that. By the end of the sixth week, you should be ready to start making things happen on your own. If you be careful and follow through the course by the letter, you can begin to make money during the training. It’s ‘earn while you learn’ kind of education. I like the system. However, many people start this course with the wrong mindset. They don’t understand that it takes a little bit more than six weeks to start making some serious cash. Super Affiliate System is training course! It means that you’ll learn everything you need to know about paid ads within those six weeks. And then, you’ll have to keep rolling until you build the desired income. While I was researching to make this Super Affiliate System review, I’ve landed on many positive testimonials of people who claim and show earnings. It’s a clear sign of work well done by students and teacher. If you are interested in learning about the training in more details, you’ll have your chance down below. But first. Let’s see what else you can get if you join forces with Crestani. Super Affiliate System is continuously evolving. As it grows more, John is throwing in some cool special features like resources, weekly webinars, and other bonuses. Together with the training in a paid advertisement, you’ll get a few ready to launch campaigns already done for you. Because Crestani emphasizes on quick success, he’s doing everything to prove his point. He’ll give you access to ads, targeting campaigns, landing pages, and offers. You can use those as a template for your campaigns and cut your path to success. Like every other fair affiliate marketing training course, Super Affiliate System is running a webinar per week. Within those webinars, you’ll get a chance to receive live updates, tips, and tricks from real millionairess, news about top current top offers, and more! John has prepared a live group on Facebook where you can discuss your training so far. Many members share their experience with the system. It’s a great place to learn and stay updated. John is very active within his community also. I hope you enjoy my review so far. Super Affiliate System is an extensive course which has a lot to offer. Let’s take an even closer look, shall we? Now then you know what is this corse about, we can get into the more detailed walkthrough. As I’ve said already, the course runs through six weeks. You’ll have to prepare yourself to finish what you start because that’s the only way how Crestani’s system can work. Also, be ready for further investment. You’ll have to buy a brand new hosting for your site. And, you’ll have to prepare a couple of hundred more for advertisement. During the first week, you and John are going to go over some basic requirements for your new affiliate marketing business. You’ll have to buy and register a domain name. Also, you’ll learn how to set up the website if you don’t know. John is going to walk you through setting your Facebook ads account, finding the right networks to work with, and more. The right mental attitude is going to be more than necessary if you want to follow through the Super Affiliate System. People tend to give up because they are not prepared for it. Don’t skip this module! Also, you’re going to go over niche research. In this module, you’ll get to know your future users in more detail. It’s a critical part of the training so don’t take it too lightly. 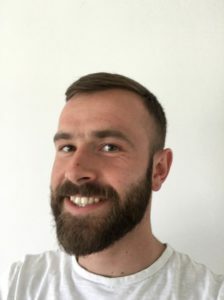 You’re going to meet one of Crestani’s friends and successful 7-figure copywriter, Ronnie. He’s going to teach you some basic copywriting skills. John, on the other hand, is going to show you his copywriting formula that works for him every time! All this is going to be critical for your ads that you’re going to create. When week four comes in, you should be having your grounds ready. It’s going to be the time to start getting more familiar with Facebook and Google ads. John is going to show you a few case studies. 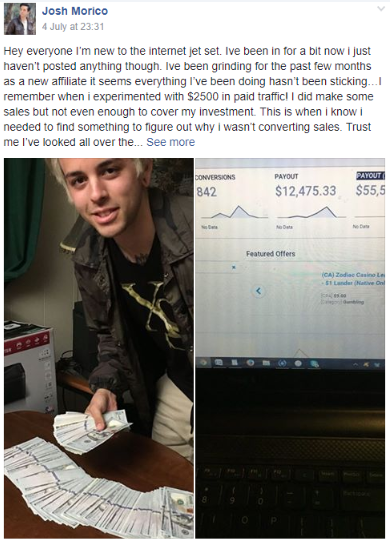 And his guest, Brian, is going to walk you through the process of making $100k per month on Facebook ads. In week five, your advertisement skills are going to reach another level with native ads. John is going to teach you how to set them up properly. You are familiar with John’s YouTube ad for Super Affiliate System. He’s going to show you the secrets of YouTube so you can reach the maximum ROI. By the end of week five, you should be having an effective campaign in your hands. Now it’s time to learn how to scale your business from $1k to $20k. John is going to show you a few case studies, as well as ways how to use survey funnels to do so. Many people have been having a lot of success with John Crestani’s affiliate marketing course. He’s helping people every day to create a passive income online. Some of his students even managed to quit their 9-5 job all thanks to the successful application of his system. On the other hand, if you read some of the reviews that appear online, you’ll catch a couple of negative testimonials as well. For me, that is a perfectly normal situation. The success ratio with this kind of programs is usually meager. 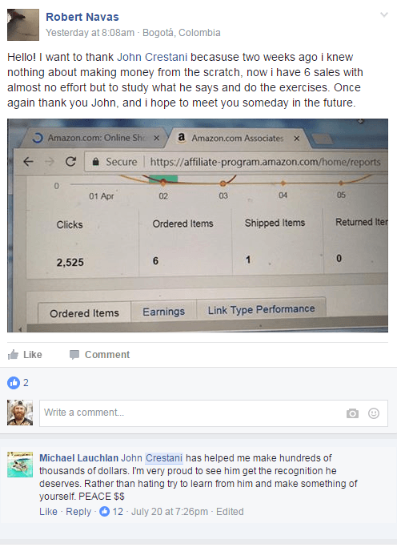 Here are some screenshots from the SAS private Facebook group where people share their success stories and motivate each other to follow through the training. Now, here’s the deal. The main Crestani’s course is a costly one. However, if you decide to buy Super Affiliate System, for $997 you’ll get complete access to all the features. This deal includes live webinars, private community, basic and advanced affiliate marketing training, live help, bonus material, and more. If you pay $997 one time, you’ll get the Internet Jetset as bonus material. Moreover, it’s going to be necessary to learn from the basic course to achieve maximum success. Crestani shares quite a few golden nuggets in those videos. As I have mentioned for a few times so far within this review, you’ll have to make sure that you’ll have at least $1k on the side for additional costs. By this, I mean that you’ll have to buy your hosting. There are different hosting available, but John recommends ClickFunels which is one of the best online. They go for a $97/per month. Then, you’ll have to buy a domain as well which is around $15/yearly. In the end, your most significant investment will be the advertisement itself. You can expect to spend between $1-2K on a paid advertisement across Facebook, YouTube, and Google. If you want to get the best results from Crestani’s Super Affiliate System, you’ll have to be sure that you come well prepared. And by this, I mean that your stack is high. In my opinion, you’ll have to be able to follow the orders by the letter if you want to succeed with this affiliate marketing training. This course is straightforward. Crestani is not leaving you too much room for thinking because he’s giving you a system that works. Super Affiliate System is not a scam or anything of that matter. Many people think so because they have purchased Internet Jetset and they haven’t made any money with it. Internet Jetset is only a lurk to buy the whole package. It is a part of the system, but it’s only a first step of the puzzle. If you are a complete beginner, then you should buy only Internet Jetset. Then you should study it until you get a full understanding of how affiliate marketing works. And by this, I mean on the version of the business model that relies on paid advertisement. Then, when you feel ready to start with Super Affiliate System, you can buy the whole course. The SAS training itself is one of the best courses on Facebook, YouTube and Google advertisement you’ll find online. John Crestani is a guy who has achieved a vast success using these methods over the last few years. He’s willing to share them with you, all of them. However, keep in mind that it’ll cost you a couple of K’s to apply the model and certainly not a few bucks as it’s maybe advertised. If you ask me would I recommend this course to my friend, I would say, yes, I would. However, I did my best all through my Super Affiliate System review to show you what to expect if you decide to go with it. It’s not an overnight success. It’s not a get rich quick scheme. This course is not a magic stick that works just like that because you wish for it. This course is a comprehensive affiliate marketing training on how to use paid advertisement methods to reach the customers, offer them a product, and ultimately, make the sale. Expect a lot of hard work and tons of brand new information during those six weeks. As well as, prepare at least $3K for all the expenses including the course itself. If you follow through the course and do everything as John tells you to do, you’ll make Super Affiliate System work for you. If you are, on the other hand, looking for something light which doesn’t require too much of initial investment, I have a great recommendation down below. You see, I can offer you access to a training program similar to Crestani’s. However, my recommendation is ideal for complete beginners with zero knowledge! The best thing is, you can start for FREE. After you join with a free account, you’ll be offered to take PREMIUM membership for only $19 for the first month. Afterward, it’ll be $49 per month. And even if you don’t take premium membership, you can still learn all the basics from Crestani’s Internet Jetset for free. Hi Effie, there is something for every taste. I believe that the best way is to start slowly, understand the business model first, learn how to SEO a website. Then, once you master organic traffic which is going to earn you nice passive income, you can learn from Super Affiliate System. Another good one, but even more expensive is AWOL Academy. They teach how to master paid traffic as well. However, both of the courses are marked as MLM so be careful. I will always recommend Wealthy Affiliate to everyone who is looking to start with organic traffic first. They are the best training platform for learning how to master Google, Yahoo, and Bing. Online Entrepreneur Certification and Affiliate Bootcamp (Wealthy Affiliate) are the best courses there is to learn SEO. Great review of the super affiliate system and comparison with internet jetset. Ivan, I totally agree with you about John’s selling methodology. I am more on your end about being transparent upfront. One thing I have learned is to duplicate what other successful leaders are doing and when is working for me, then add my personality to it.